“When we use plants as medicine it is important not to just think of them as substances, but as people who are helping us. Being with the plants in this way is being in relationship with them. Not a relationship that is going to last five minutes, but a lifetime of relationship with the plant nation, the plant people. We all are capable of knowing the plants intimately and learning from them how to use their medicines. This is the study of wild plants and how we can apply them medicinally for acute situations as well as in depth discussion as to how to incorporate the plants into our everyday lives. What does it mean to use plants as medicine on a daily basis? To get to know the plants we explore them through taste, touch, smell, sight, and feeling. This is where we discuss preparation, dosage, uses and how to apply them into your life. Your teeth are alive! We explore tooth health in depth with the focus of how to prevent tooth/gum issues, as well as how to deal with common tooth ailments such as cavities and acute tooth infections. Doug teaches very simple yet powerful techniques in which students learn to empower themselves through personal tooth care. With Dougs incredible life long knowledge of diet and eating wild edibles on a consistent basis (sometimes solely) he brings a unique, fun and creative relationship to eating plants of the wild. Drawing from Doug’s vast experience in outdoor living, we study how to use wild plants and natural material in first aid situations. Whether you are traveling or participating in your daily life a medicine bag can be of daily assistance to understanding key concepts for maintaining vibrant health. 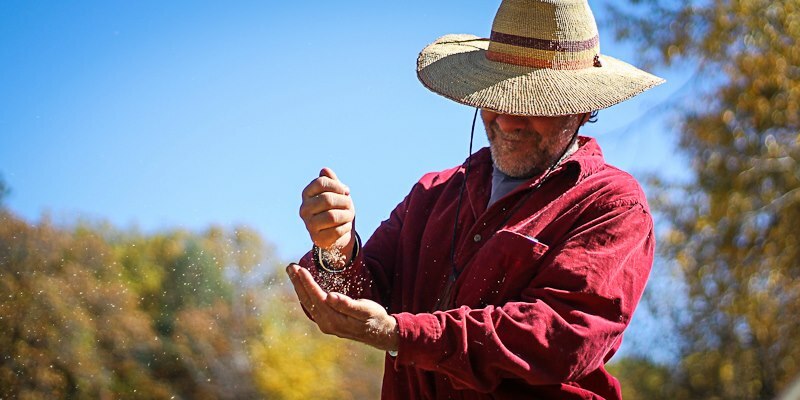 In this class, Doug teaches in depth ways to discern the appropriate plant medicine and the appropriate timing to match with your individual needs. In this class we discuss the several ways of making herbal medicines such as hot infusions, cold infusions, decoctions, tinctures, honeys, cough syrups, botanical oils, salves, poultices, liniments and more. In this class we study the importance of poulticing, one of the most powerful herbal medicines available. We identifying plants that are appropriate and when and how to apply this art. This is a class where we have the opportunity to practice deep and meaningful plant communication. Doug shares a technique which he has found to be incredibly useful and has used for many, many years to journey with the plants. In this class Doug reflects on his experience treating and healing the Gall Bladder with herbal medicine. We will discuss what it means to have balance in the gall bladder, how to recognize where there is imbalance, and the ways that we go about supporting its well-being. A foundation to strong and vibrant health, the kidneys are a critical aspect of energetic living. Doug teaches the function of the kidney/adrenals and their relationship to our energetic channels by way of the Chinese medicine traditions. He shares how to identify imbalance, as well as how to repair, support and maintain good balance by way of herbs and lifestyle choices. In this class, Doug offers us a new way to consider the diagnosis of arthritis and osteoporosis. With an emphasis on prevention, students are led to an understanding of these ailments that are often deemed incurable and unavoidable. The pitch, needles, nuts, and wood of the pine tree family hold a great amount of potential to help heal, feed and supply us. In this class we learn how to harvest and use the food and medicine of the pine trees as well as what parts can be used for tools such as primitive glue and fire kits. In the allopathic way of medicine, type 2 diabetes is considered a disease. In this class we approach diabetes as a condition. Diabetes can become stable, responsive to diet, life-style and herbal remedies. Doug shares with students in this class how to balance a body affected by diabetes with nutrition and herbal medicine as well as the many ways to prevent such an affection. A common infection suffered by many women of all ages and of varied health, urinary tract infections are often treated by antibiotics. In this class, students are guided to a better understanding of the many functions beyond bacteria that cause a urinary tract infection. Students are empowered to gain an understanding of what conditions put them at risk and how to avoid those conditions, as well as learn effective herbal remedies for when imbalance occurs.